When Haven’s family moved into their mid-century-style home in July 2014, the front yard was a traditional patch of Bermuda grass and boxwood hedges. 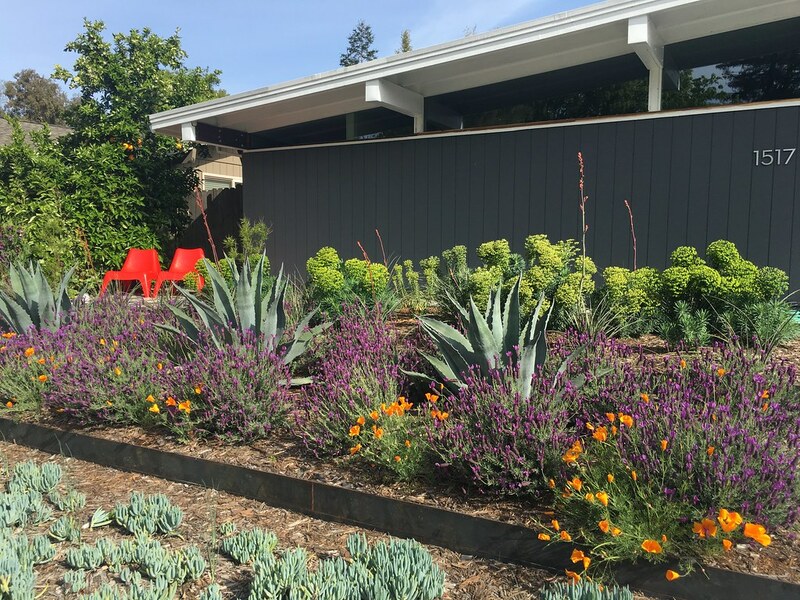 But, as a landscape architect, special projects manager for the UC Davis Arboretum and Public Garden, design principal at Restoration Landscaping Company, and lecturer in the UC Davis Department of Landscape Architecture and Environmental Design, she knew what to do next — the lawn had to go. In the winter the Kiers family, as well as native birds and bees, enjoy the torches of orange and yellow flowers of Kniphofia ‘Christmas Cheer’, in summer the Bulbine frutescens (Cape balsam), and in spring the Lavandula stoechas ‘Otto Quast’ (Spanish lavender). As for fall, Haven is reviewing her options and considering bulbs! Last, but not least, after the new landscape was installed, the Kiers family received their first “smiley-faced” water bill!